In the 32nd Century, the Doctor finds himself on a planet piled high with discarded computer technology. Picking over these remains are an army of Scandroids, a collection of unsavoury, illegal Data Pirates and a team of researchers from the mysterious Lonway Clinic. This is a world of organic-digital transfer and ‘personality surgery’ which the Doctor finds disturbing enough, until something far more deadly starts to emerge. Earth, 1974. An innocent phone call. Okay, it was a wrong number, but there can’t be any harm in that. Can there? I.D. is a solid story as well as a rushed story. A tale about personality modification, bioware, and data gathering, the three-part “base under siege” comes together quickly, with several intriguing characters and a few neat science fiction concepts. But the compressed run time of the story means that “intriguing” fails to become “interesting” with several important plot points being rushed through or glossed over, leading to a abrupt and somewhat unsatisfying conclusion. The three-part serial leaves room on the CD, however, for an enjoyable “one-shot” adventure where a young London professional keeps calling wrong numbers, that the Doctor is compelled to pick up. Eddie Robson has written multiple stories for Big Finish’s Doctor Who and Bernice Summerfield ranges, including two of Paul McGann’s finer stories, Memory Lane and Human Resources. I.D. is a standard “base under siege” serial, but Robson adds in a few unique turns to the concept. The critical information that the Scandroids attempt to pass on could have easily been some sort of malevolent computer virus, but it turns out to be something much more complex and intriguing. The identity and purpose of this information directly ties into two other concepts that I.D. touches upon – personal identity and human augmentation, in a setting where personalities can be written (with easy payment terms) and humanity has forgone keyboards and data pads for direct communication with computers via bio-electrical equipment. It’s all pretty interesting stuff, and I would have loved to have spent more time learning about this setting, peeling back the layers to get to the truth. Sadly, when the truth does come out, it comes out in the form of a rushed exposition that begged for a little more time to be truly explored. The story’s well paced and things happen quickly with very little padding, but the crux of the third episode’s conflict needed more backing and build-up to truly make “this Scandroid and this monster are now going to beat the crap out of each other” mean something, especially considering the ethical ramifications that color the final few minutes of the story. In something else I found interesting, Robson really doesn’t give us a secondary character to root for, making them all flawed in some way. Some are more likable than others, such as the data pirate Gabe as played by Joe Thompson, but even then he’s a mercenary type who tries to profit off the death of his own mother and only acts to save his own skin. Gyles Brandreth (writer, broadcaster, former Conservative member of Parliament) plays Doctor Marriott, the standard “greedy corporate scientist” who’s on the planet looking for one critical piece of data which, of course, ends up almost dooming everyone. Helen Atkinson Wood is Tevez, company accountant, who acts solely to ensure the company’s profit margin. Atkinson Wood plays the part well, and her ethical musings at the end of I.D. are interesting ones – in a group of people with the same downloaded personality, does that make the last person standing the “original” copy? The actress who plays Bridge has an interesting tie to the classic series of Doctor Who. Bonnie Langford was considering leaving the series during the filming of the Seventh Doctor serial Delta and the Bannermen. If that had happened, the character of Rachel Defwyyd, played by Sara Griffiths, would have become the Doctor’s new companion. 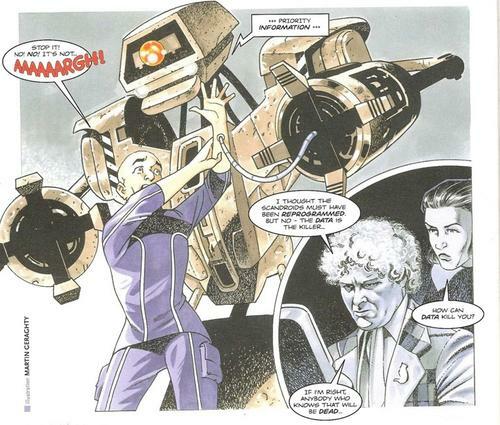 Instead, Langford stayed on for one more story, Sophie Aldred became a new companion, and history rolled on. Bridge is not a character to cheer for in this story – she isn’t evil, but she’s without conscience or feelings of guilt, looking at everything from a cost/benefit point of view. The reason for this ties into the concept of personality writing which brings about a moment of clarity late in the story. But the moment again feels a bit rushed and that there should have been more to it. It leads to Bridge’s ending and final decision feeling…a bit hollow, like she’s making a decision solely because it’s what the Doctor wants to hear. It could have been meant as a moment of ambiguity, but doesn’t feel like it was truly earned. This is Colin Baker’s third main range story without a companion, the first one being the classic story Davros and the personal favorite The Wormery. It doesn’t take long for the Sixth Doctor to find a pretty girl to tag along with of course, but Baker proves just how fine he can be when he’s flying solo! This is the kind of adventure old Sixie thrives in; technology run wild, corporations and criminals trying to save their own skin, ethical standards being compromised, and there’s the Sixth Doctor right in the center of it all, taking charge without anyone noticing, condemning technology progress made without morality or effort, dishing out the insults as well as taking them, and always looking forward to the small things, such as a future argument! If I had to pick a story that truly summed up just how awesome the Sixth Doctor is and what Big Finish has done to rehabilitate him, I admit I would probably choose I.D.. Davros is great, but it’s because Baker and Malloy have such great chemistry, and the same goes for his time with Evelyn/Maggie Stables. 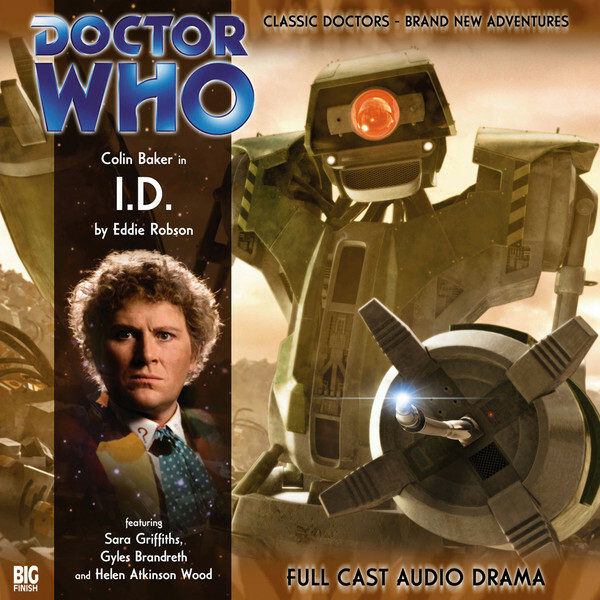 I.D is carried by Colin Baker’s performance, and it’s a really cracker of a turn. The music and sound work by Steve Foxon ties in very well to the story. The Scandroids reminded me of old-school Cylons from the 1970’s Battlestar Galactica with their proclamation of “priority information,” with the addition of thumping, heavy footsteps. The wild junkyards come alive through the falling of debris and wind whistling through canyons of discarded equipment, and the fight scenes between the mutations near the end of the story are vividly painted with thwacking impacts and laser beams cutting through the air. As I’ve mentioned earlier, I.D. is a three-part story. For this Main Range release, as well several other stories including the upcoming Extron and The Wishing Beast, Big Finish produced a one-part story and placed it on the second CD. I don’t know why – budget issues, scheduling concerns, a little shake-up in the release schedule, or just the urge to try something a little different now and again. Urgent Calls sees a young London professional (Kate Brown of Nekromanteia and Cuddlesome) make several phone calls to wrong numbers, but each wrong number is picked up by a mysterious man who had the overwhelming urge to answer the ringing phone. It’s a neat little story, with some moments of body horror, with the overall theme being “how does interacting with the Doctor’s life change someone else’s?” The story is told solely through the main character’s eyes, but just being introduced to the idea that there’s alien life out the in the galaxy radically changes everything about her life. How could she see her mundane job in the same way again? She never meets the Doctor directly, but years after the fact she pens a letter to him and drops it in the mail, knowing that somehow, it will find its way to him. It’s a nice tale that encapsulates how I think most of us would react if we met the Doctor or found out that there is life on other planets. I.D. is a solid “base under siege”story that suffers from being too brief, feeling rushed with several potential concepts and plot points underdeveloped, but containing a wonderful turn by Colin Baker at the Sixth Doctor. When put together with the one-shot story Urgent Calls, I.D. is a story I have no problems recommending. Cobi’s snynopsis – I.D. feels rushed and underdeveloped, but it’s still a solid “base under siege” serial with a great Colin Baker performance. Urgent Calls is a enjoyable one-part tale that shows just how a normal person reacts when the Doctor keeps picking up their phone calls. Peter Davison is the Doctor in…Extoron. This entry was posted in Big Finish Review and tagged Big Finish, Big Finish Audio, Big Finish Review, Colin Baker, Doctor Who, Doctor Who Audio, Doctor Who Review, Sixth Doctor, TARDIS. Bookmark the permalink.